Maurice Joseph Micklewhite Jr was born on the 14th March 1933 in Bermondsey, London. He was to become one of Britain's most successful and respected actors, but it wasn't going to be easy. "I was named after my father and I was knighted in his name because I love my father"
Caine's father was a was fish-market porter and his mother a charlady. He left school at fifteen and took his first job as a meat porter. He had various working-class jobs before serving with the British Army in Korea, where he experienced combat. Returning to England battle hardened and determined to create a better life for himself he threw his energy towards the theatre and managed to get a job as an assistant stage manager. He could not afford to attend stage school, but battled on with his ambition to be an actor. Proud of his humble roots, he hung on to his working class accent at a time when, as an actor, it was considered both unfashionable and unwise And he has never shied away from taking on a B-list movie role and he has never shied away from taking on a B-list movie role. He adopted the name of Caine on the advice of his agent, taking it from a "Caine Mutiny" marquee. In the following years, he worked on more than 100 television dramas, with theatrical companies throughout the UK and eventually in "The Long and the Short and the Tail," as Peter O'Toole's understudy, which was a stage hit. 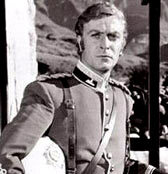 It was the 1964 hit film "Zulu" that eventually brought international attention to Caine. He could of quite easily played a lowly Cockney soldier, but he played an articulate, aristocratic officer, something which had a major influence on his perceived acting ability. 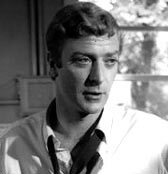 By now Caine was on the right tracks, bringing a fresh breath of wind to British cinema. He epitomized the new breed of actor in mid-sixties England, the working-class bloke with glasses and a down-home accent - his next role couldn't have been more perfect. Starring in "Alfie" made Caine a household name and he was having script after script thrown at him. His carefully selected roles in films like 'Get Carter' and 'The Italian Job' were just as central to the swinging sixties as The Beatles, the mini skirt, the mini and E-Type Jags. Michael Caine has become one of those people who have and still continue to make an impact on the whole country and within his whole field of work. 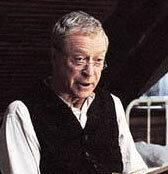 There are good actors, great actors and there is Sir Michael Caine. He is held in deep regard by today's entertainment stars. 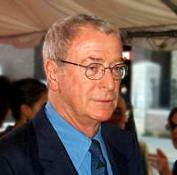 Broadcaster Chris Evans cites Sir Michael Caine as a major influence. Actress Kate Winslet calls him "a living legend". Right up to his more recent films Caine can get the movie world whipped up. His Oscar winning role in 'The Cider House Rules', caused protest due to the hard hitting role in which he played an abortionist. But with his knighthood Sir Michael can reflect on his career with a great amount of pride. He is undoubtedly one of the best all time actors, a legend of our time. Caine, who loves the heat and laid-back feeling of Los Angeles, lives there now with his wife Shakira and their daughter Natasha "up in the hills with the deer and coyotes and squirrels and rabbits and God knows what else." During the 1930's Michael and his parents moved to a two roomed flat in Urlwin St, London. It was a cramped, uncomfortable affair, with the two parents sharing a room with their son, who slept in a small bed in the corner. The family, in common with many working class families at the time, was short of money. But they had no shortage of fish, thanks to Caine's father's job at Billingsgate Market, expensive fish would 'fall of the back of various lorries'. "In this area of working class London it was indeed rare to find any lorry with a fully-functioning and efficient tailgate mechanism." Caine wrote in his autobiography. In Caine's 1992 autobiography, 'What’s It All About', Caine reveals less-than fond memories of his days in South East London. He talks of being frightened by the 'spivs' at the Elephant and Castle who sewed razor blades into the brims of their trilby hats and clearly has little romantic attachment to the area. "The elephant was not exactly a classy district. The streets were as rough and dangerous as it was possible to get without anybody actually declaring war, and even the cinema was not without its perils"
The Queen knighted Michael Caine at Buckingham Palace on Thursday 16th November, 2000, as Sir Maurice Micklewhite. During the ceremony with the Queen the 67-year-old actor used his real name, but will be known professionally as Sir Michael Caine. "I always kept my real name - I'm a very private and family-orientated person." He added: The honour follows his second Oscar, awarded in March, and a Bafta fellowship, where he used his speech as a platform for his frustrations. He told the audience that he felt like he never really belonged in Britain and that he was a loner and on the outside. 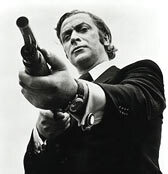 But Caine's knighthood confirms he has now been embraced as a fully-fledged member of the British establishment.